Last night the audience at the Bull were serenaded by a supergroup of Shooters Hill Musicians. The bassist and both singers from OCD joined Stardust and Sequins for much of their set, and the singer from the Longdicks guested on an Iggy and the Stooges track (see pic). 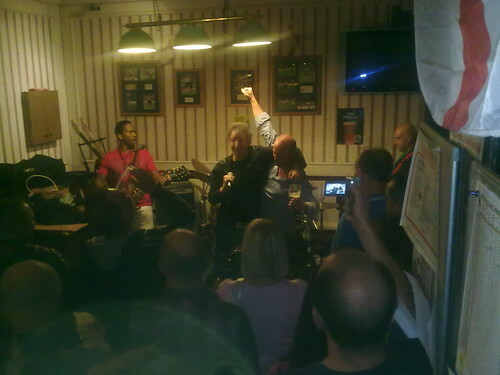 The main band have played at the Bull a number of times, and attracted a big crowd, at one point it got so tight that someone took the opportunity to make a “We’re all in it together” quip – it was certainly encouraging to see the pub so busy. Last night they played more material from the art rock side of their repertoire, drawing from Ziggy Stardust, The Velvet Undeground, and Roxy Music. They also played a bit of surf rock to give the drummer a chance to perform some trickery, and some Jimi Hendrix, allowing the guitarist to do likewise. Si’s Smokin’ Aces on Saturday 10th September.